All transactions are safe and secure with a reliable history in online purchasing behind each of our associates. 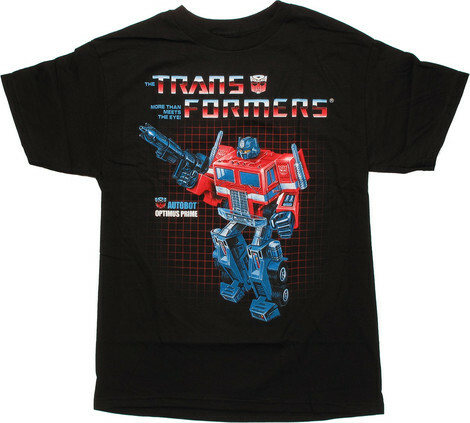 Buy the Transformers Box Art t-shirt to own Transformers clothing and merchandise. This cool tee features the vintage Optimus Prime Transformers box art. Whether you're a fan of the cartoon or the Transformers live-action movie, this retro design celebrates the origins of the Autobot leader. If you imagine you're being chased by Starscream and the rest of the Decepticons, this Transformers t-shirt is a perfect way to show you'll do what it takes to fight the enemy, like changing into a truck. Wear it to your next party. Maybe Blaster or Soundwave will play you a few of the Strokes band's tracks for you. In addition to the Transformers Box Art tee above, browse the Transformers Clothing Gallery for more apparel like men's and women's clothes, kids shirts or hoodies.